I think that October is my favorite month of the year. It’s when all the weird hiding in the world comes out to play. Halloween is an excellent holiday that more adults should celebrate, a fact I learned living in Burlington, Vermont for the last several years. The temperature drops and the leaves change, and as if to shake them free, the wind picks up. Chilly nights make for excellent sleeping, and soon Delaware will be cold enough for me to break out my extensive collection of flannel shirts. Pietro’s Caprese Pizza is a pie full of fresh flavors perfect to pair with a brisk Autumn evening: diced plum tomatoes, chopped garlic, and fresh mozzarella on an olive oil base topped with fresh basil, balsamic reduction, and pecorino romano cheese. 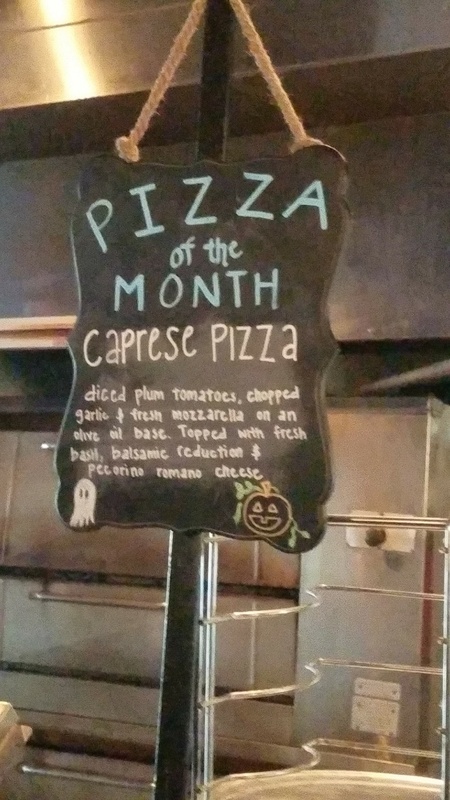 I’ve come to expect Pietro’s Pizza to deliver a well conceived pie, and this month’s flavor is no exception. Despite the amount of balsamic reduction that drained through the bottom crust, the pizza held together quite well. Speaking of the crust, Pietro’s is still making some of the best crust in town, which I always dip in their blue cheese dressing, made in house. This pizza, though, provides its own crust dip: the balsamic that’s still on the plate after you’ve picked up your slice. That being said, it’s not that there’s a ton of it topping the Caprese. It’s the nature of the thin dressing to run, but that doesn’t mean there won’t be any on the slice in your hand. In my other hand was a glass of Sweet Sweetback’s Badass Wheat, a light hefeweizen with clove and sour notes floating among the usual pleasantness a wheat ale tends to offer. It was just the thing to wash down the delightfully acidic Caprese, and the notes of sour in the Badass Wheat made my palate sing with cohesive glory. You know what they say, though, and time did fly while I was having fun with this meal. I found myself wanting more after I’d finished it, but I also couldn’t justify eating two personal pizzas in one sitting. These flavors aren’t ones to miss, and they’ll only be around this month. I might have to go back before it’s gone just to have it one more time.